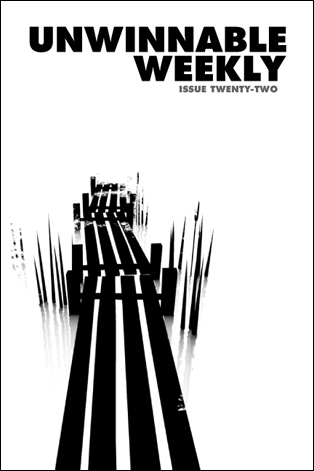 This is a reprint of the letter from the editor in Unwinnable Weekly Issue Twenty-Two. You can buy Issue Twenty-Two individually now, or purchase a one-month subscription to make sure you never miss and issue! When I sat down to put together this issue, I was in a minimal mood. Maybe it was the grit of October, with its dark, saturated Halloween colors that got me in the mind set, or maybe it was a consequence of adjusting to daylight savings. Whatever the cause, I found myself in the mood for stark black and white, with as few images as possible. I wanted the words to stand bleakly on the page. This is the season for minimalism. As the weather gets colder, the trees shed their leaves and stretch like grasping hands towards a sky suddenly more expansive. Soon, the snow will come and reduce the world to white contours. I like this time of year. The starkness is appealing. Of course, the physical world stands in contrast to our increasingly cluttered day to day lives. The holidays are nigh, with their requisite bustle and hoo-ha. There is nothing minimal about Thanksgiving dinner. As I get older, I find myself increasingly searching for quiet places to read, just me and the page. Particularly around this time of year. 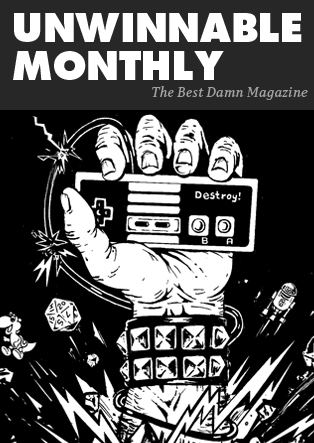 If you are of the same mind, I hope this issue of Unwinnable Weekly makes for a good companion as the nights get longer. A happy minimalist coincidence, this week’s cover story from Gavin Craig uses The Unfinished Swan as a jumping off point to explore recent evolutions in the FPS genre. Luke Arthur takes on a different kind of bleakness as he examines the brutal war comic Uber, by Kieron Gillen and Canaan White. Matt Perez confesses to being a cheater in The Sims and ruminates on the lack of cheat codes in life. Finally, Corey Milne brings us an amazing bit of fan fiction that inserts some notable figures in the game industry into the world of Judge Dredd. In other news, we’ve only got four issues left until the end of the year. We’ll be taking off the week of Thanksgiving and our final issue of 2014, the Yule Tide Special Issue, will drop on December 12. Unwinnable Weekly will return on January 9. While we’re gone, though, we’ll still be busy bringing you daily stories on the website, as well as our year end Best Of lists. As ever, I welcome you comments and thought via email at stuhorvath@unwinnable.com. The distance between the player and the screen creates a sort of an invisible hallway, a tunnel with a virtual world on the other end. By allowing players to look around, and thus to direct this tunnel independently of actually moving, FPSes create a visual grammar for reading the world as well as a system to traverse it. [The intense violence] makes Uber a genuinely uncomfortable experience at times. It speaks to a reader as a person who feels pain. War isn’t just a market for death. That may be the end point, but it’s something else entirely to consider the journey there, a journey of prolonged, felt obliteration. War is a grotesquely sensual experience. Judge Ellison knew the second boy would make a move. He’d barely begun to lunge when she laid a vicious backhand into his face. It hit him like a ton of rockrete on a run away zoomer. Out for the count.